We're sleeping in one of the highest treehouses in the world, 40m above the ground in Laos, in the hope of spotting a black crested gibbon. The only way in and out of this sky-high structure is via a zipline. It's part of The Gibbon Experience, an innovative tourism-based conservation project and although these apes are rare – only 1300-2000 exist in the wild – I'm hoping I might catch a glimpse. We've chosen the Classic Experience. It's a three-day, two-night stay in the Nam Kan National Protected Park and is a tour with less trekking but a higher chance of spotting gibbons. There are 11 distinct groups in the 136,000 hectares of mixed deciduous forest, the only viable population outside Southern China. Our journey into the jungle begins in Ban Houayxay, on the border of Thailand. We pile into the back of a songthaew, a Thai-style open air bus, with other travellers, ages ranging from 19 to late 50s, for a bumpy ride. We've only brought essentials in a small pack; extra camera batteries; a torch; mosquito repellent; everything else is provided. We hop out at Ban Toup, a small village within the protected area and begin the walk through rice paddies until we reach the menacing thick green foliage that rises from it. It'll take an hour of heavy uphill trekking in the heat before we reach our first stop. The bamboo shoots thick and high, spindling into arches, giant cicadas and butterflies float and buzz around us. 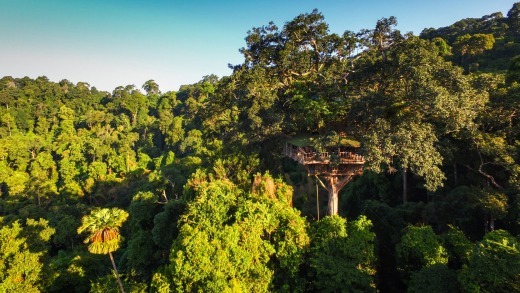 At The Gibbon Experience in Laos travellers stay in sky-high accommodation. It's clear there are few visitors here. The Gibbon Experience began in 1996 and now gives more than 120 people living in the jungle full-time work, funds a anti-poaching patrol team and commits to reforestation through the planting of 100,000 tree annually. Upon arrival we are split into groups and are shown how to put on our ziplining gear. There are tears as we reach the first launch point, it's a huge distance and very high, I'm terrified, but also excited. In March 2017, an accident resulted in the death of a traveller here. After an investigation and overhaul of safety measures, tours resumed. Our two guides, Mor and Jerjha are so focused on safety it puts us at ease. The adrenaline kicks in and we're off, hurtling into the jungle mist, high above the luscious green, wind in our faces – the jungle seems to go on forever. 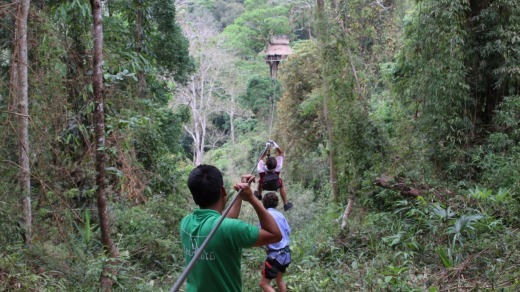 The Gibbon Experience boasts 15 kilometres of ziplines, some as long as 600 metres. Childhood fantasies are realised when we finally reach our treehouse. 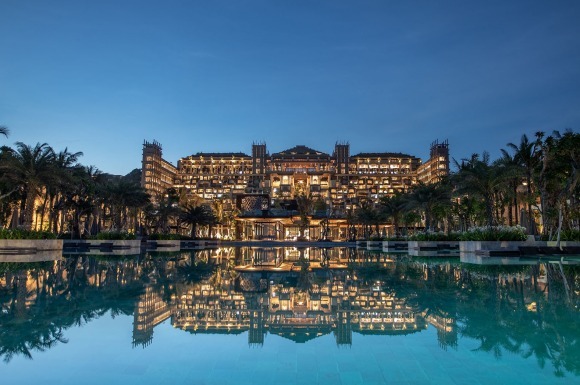 It's magical and reminiscent of the 1960s film The Swiss Family Robinson. The welcoming cacophony of the jungle envelopes us as we fly in and walk up the three flights of stairs to the top level of the house, cradled by a mammoth strangler fig. We choose a spot under the arm of the tree to sleep, where a leather-bound mattress, bedding and dark mosquito net await us, there's nothing but an uninterrupted view of the green horizon from our bed. It's also a perfect height to spot wildlife and it's not long before our group is huddled in the kitchen, talking quietly with binoculars in hand. The slight rustle of leaves in the distance is enough to excite the group, but we are happy with the sight of a hornbill. I wash off the sweat of the day in a shower set upon an open wall to the vast jungle. It's liberating and beautiful and the best cold shower I've ever had. Water slips between my toes and the cracks of the wood and it's seconds before the droplets reach the lower jungle canopy 40 metres below. It's not long before dinner, and our meals are cooked and prepared in the nearby village and ziplined in. They're traditional delicious Laotian: noodles and rice with vegetarian and meat dishes. We are woken in the middle of the night by the sound of thunder. Lightning floods the black sky but we're surprised when we find we aren't wet – the clever design of the treehouse shelters us from the rain. 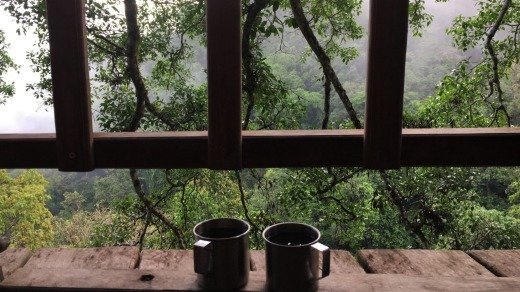 As first light breaks over the forest we hear the distant call of the gibbons. For almost 30 minutes the howl rises and falls. It's wonderful. We take the binoculars and talk quietly. There's movement in a tree not so far, long tails swing and whole branches rustle. We've found them! Silhouetted as they pull and play with each other in the arms of a giant evergreen. Jerjha comes to look, and he's quick to correct us. It's a family of langurs, their white moustached faces unaware we are observing them. We watch them until they pile down, leaping upon the tips of bamboo shoots. Jerjha says gibbons are territorial, so the monkeys may dash our hopes of seeing one. We don't mind. We feel lucky to be watching these langurs playing in the wild. 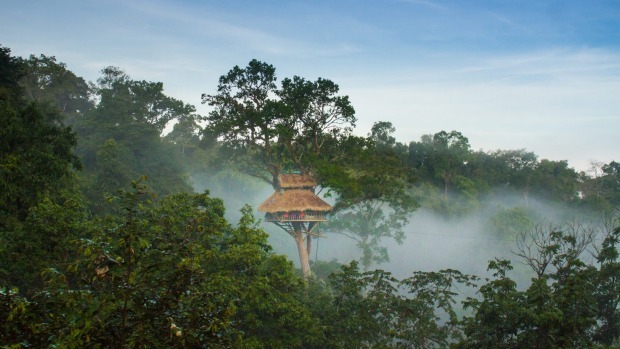 Then the buzz of the zipline interrupts our gaze, our breakfast has flown in and we sit down to it before we set off to explore another four thatched roofed treehouses set up by The Gibbon Experience. 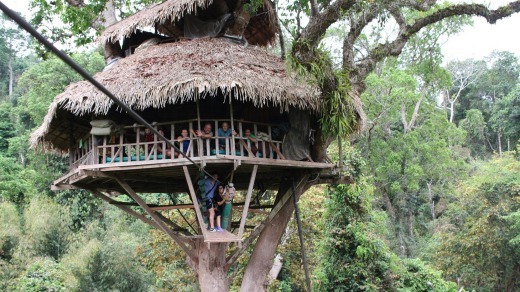 All are different and offer sweeping bird's eye views of the jungle. 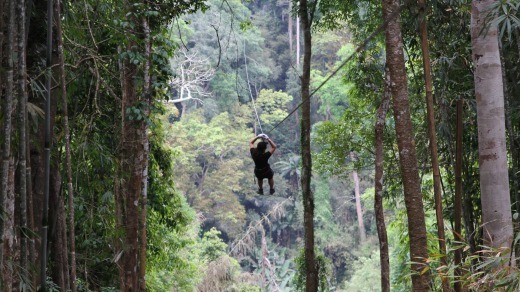 During an afternoon of ziplining, our guide, Mor, has spotted a gibbon swinging far in the distance. I sit on the edge of a suspended platform hugging a tree, my feet dangling high above the ground and see giant branches being tugged, but it's hard to see what is swinging from each one. We return as the sun begins to cast a golden shade across the tree tops and are met by another huddle. The langurs are back at our treehouse, and this time we catch a glimpse of a mother cuddling her bright orange baby. Our guides brew us up some "jungle tea" made from the root of a fern found in the Nam Kan, we share a beer between us as we settle in for the night. With morning comes our departure. It's sad to leave. We've fallen in love with our jungle home. Flights run from Melbourne and Sydney to Luang Prabang or Vientiane, Laos via Singapore Airlines, Cathay Pacific or Thai Airways. There are flights from Vientiane to Houayxay on Lao Skyway. Houayxay can also be reached via a leisurely two-day long boat on the Mekong from Luang Prabang with a one-night stop in Pak Beng, or a less comfortable but faster speed boat.